LAMBERT, PATRICK, Roman Catholic priest, Franciscan, and vicar apostolic of Newfoundland; b. c. 1755 in the parish of Kildavin, County Wexford (Republic of Ireland); d. 23 Sept. 1816 in Wexford. Patrick Lambert first appears in 1780 at the Irish Franciscan college at Louvain (Belgium), where he became lector in philosophy. In 1783 he transferred to Rome as president of St Isidore’s, also an Irish Franciscan college, but resigned this appointment the following year. He returned to Ireland in 1785, serving as guardian of the monastery in Kilkenny until 1793. Thereafter he was associated with the Wexford friary and taught at the Franciscan academy attached to it. 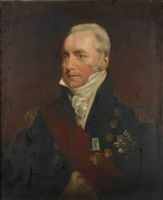 For some years he was president of the academy, and was guardian of the friary from 1801 to 1803. While at Wexford, Lambert held several important offices in the administration of the Franciscan province of Ireland. He was the Leinster definitor from 1794 to 1801 and was elected custos in 1803. From the death of the provincial in September 1803 to July 1804, Lambert headed the order as vicar provincial. In 1804 the ailing vicar apostolic of Newfoundland, James Louis O’Donel, requested a coadjutor bishop with the right of succession. Early the following year, from candidates proposed by Archbishop John Thomas Troy of Dublin, Rome selected Father Bonaventure Stewart, the new Irish Franciscan provincial, but he resigned before being consecrated, and on 30 July Lambert was appointed instead. Elevated to the episcopacy with the title of bishop of Chytra on 4 May 1806 at Wexford, Lambert arrived in St John’s that August. He served as O’Donel’s coadjutor until the latter’s resignation on 1 Jan. 1807, whereupon he succeeded as vicar apostolic. From the beginning Lambert was unhappy in his appointment. Even before his consecration he had suggested to the Holy See that he would prefer a more temperate climate. He indeed found the weather in Newfoundland inclement, and the people “passably instructed, but not even passably obedient . . . with many immersed in the Depths of lust, prone to Drunkeness, and even infected with the Rash of the new philosophy.” By November 1807 he had asked the pope (in vain) to transfer him to a less arduous see or to give him a pension sufficient for retirement to Ireland. None the less, Lambert attended faithfully to his episcopal duties. He visited Conception Bay in 1807, covering 21 leagues of coastline and confirming more than 400 persons. On a similar visitation of Ferryland district in 1810 he broke several ribs while travelling through the woods. In fact, Lambert had few priests to serve so large a territory – only five throughout most of his episcopate. 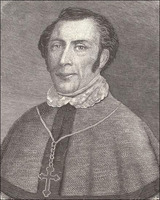 The bishop therefore made it a practice to accept students for the Newfoundland mission, both Irish-born and native Newfoundlanders, who would be trained in Quebec. The first priest ordained specifically for Newfoundland, James Sinnott, a young man who had come with Lambert from Wexford, was sent to the Séminaire de Québec in 1808 and was ordained there in 1810. 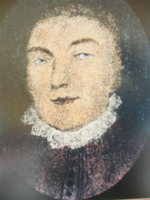 Although over the years Lambert sent several other seminarians to Lower Canada, only one other, William Herron*, ever attained the priesthood. 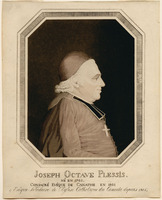 With the bishop of Quebec, Joseph-Octave Plessis*, Lambert had a cordial relationship. In 1807 and 1808 the two exchanged faculties giving one another the powers of vicars-general, and thereafter they maintained a steady correspondence. Anxious to be relieved of responsibility for part of his vast territory, in 1807 Plessis offered to transfer to Lambert responsibility for Nova Scotia, New Brunswick, and the neighbouring islands. Lambert saw nothing attractive about this offer, remarking that “I have too much sailing round the coasts of Newfoundland without going across to the Continent.” He proposed instead subdivision of the Quebec diocese, with the assurance that he would gladly be a suffragan should Quebec become a metropolitan see. Plessis did not pursue the matter, but on another occasion he did raise tentatively the possibility of attaching Labrador and Anticosti Island to Newfoundland. In 1812 he also brought to Lambert’s attention the situation of the Micmac Indians who had migrated from Nova Scotia to the St George’s Bay area; Lambert was able subsequently to send them a priest in the summer season. Lambert’s episcopate was marked by a large number of conversions to Roman Catholicism. From 1809 to 1813 especially, the letters of Protestant clergymen evidenced the success of Lambert’s priests. “Thousands along the coast” were said to have espoused Catholicism, and one Anglican missionary, John Harries, went so far as to warn that the island “will very soon become a Roman Catholic colony.” Even Governor Sir Richard Goodwin Keats* recognized the priests as being “too successful in making proselytes” and their “Zeal and Activity” as worthy of imitation. Although numerical data are lacking, this movement seems to have been especially significant in areas where Anglicans were unattended by clergy of their own. In general, the Catholic priests were much more mobile, and more regular in their visits to outlying areas, than their Protestant counterparts. An even larger factor in the growth of Newfoundland’s Roman Catholic population was the vast Irish immigration that occurred between 1811 and 1816, an influx which eventually caused the bishop major problems. The boom years of the Napoleonic Wars saw Newfoundland prosper. By the spring of 1815, however, the fishing economy had collapsed, and yet large numbers of Irish still poured into St John’s, perhaps 6,000 in that year alone. Not only was there massive unemployment and great poverty, but these conditions soon led to divisions among the Newfoundland Irish; competitive county gangs were formed and secret oaths sworn. There were important social differences between Leinster and Munster, the two Irish provinces from which immigrants came to Newfoundland, Munster being the less anglicized and heavily Irish-speaking. The long-standing rivalry which had existed between the two spilled over into Newfoundland and in 1815 led to violence between gangs of the two factions. Lambert had previously recorded his opinion of Irish newcomers as an “unprincipled and ignorant set of lawless wretches.” Now he and his clergy denounced the disorders and secret oaths in their sermons, but to no avail. Lambert spoke no Irish, and as Leinster men he and his clergy were held suspect by the other party. Furthermore, the bishop had earlier suspended Father John Power*, a priest from Munster, and this action had cost him considerable support. Indeed, the dispute between Lambert and Power appears to have greatly exacerbated interprovincial rivalry in Newfoundland. The troubles of 1815 probably contributed significantly to Lambert’s decision to leave the island that year. Lambert maintained a generally good relationship with the governors of his day. A major concession had been accorded Newfoundland Roman Catholics in 1811 when the British government permitted them cemeteries of their own, thereby ending the disputes that had sometimes accompanied Roman Catholic burials in Anglican churchyards. At the recommendation of Governor Keats, the government also authorized in 1814 the payment of an annual stipend of £75 to Lambert in his official capacity as “Head of the Catholic Church.” In fact, when Lambert had trouble with Power, Keats went so far as to recommend that the imperial government prohibit the immigration to Newfoundland of any priest not authorized by the bishop. By 1813 Lambert’s health was failing. He was subject to dizziness and violent headaches, apparently the result of an epileptic condition. 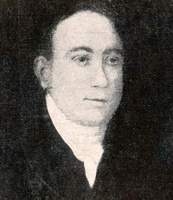 He contemplated leaving Newfoundland even then, but lie did not make a final decision until 1815, following an application to Rome to have Thomas Scallan* named as his coadjutor. On 14 November he departed for Ireland, where he took up residence at the Wexford friary. Lambert still spoke of returning to his mission even after Scallan’s nomination in January 1816, but with little conviction. He was concerned that his pension was payable only during his residence in Newfoundland, and sought to have this condition modified. By June he was said to be “exceedingly ill, deranged and childish, with no hope of recovery.” He succumbed to his illness on 23 September and was buried in the friary church at Wexford. Lambert was described by Chief Justice Caesar Colclough* as “Honest, Loyal and well-intentioned,” although “an irritable man of no abilities.” Not robust, the bishop was perhaps ill-suited to the demands of his office, and it is clear that his appointment was one he did not relish. Nevertheless, his episcopate saw the Roman Catholic church in Newfoundland acquire new strength and stability, progress which undoubtedly owed much to Lambert’s careful efforts and his moderating influence. AAQ, 12 A, G, H; 210 A, V, VII–VIII; 30 CN, I. Arch. of the Archdiocese of St John’s, Howley papers, transcripts of docs. in the Archivio della Propaganda Fide. Archivio della Propaganda Fide (Rome), Acta, 1805, 172; Scritturi riferite nei Congressi, America Antille, 3 (1790–1819). Basilica of St John the Baptist parish (St John’s), Reg. of baptisms, 1 Jan. 1807. Collegio St Isidoro (Rome), Discretorium book, 17 July 1780, 27 Feb. 1783, 27 Nov. 1784, 25 Jan. 1785. PRO, ADM 80/151; CO 194/46, 194/49, 194/51, 194/54–56, 194/81. USPG, C/CAN/Nfl., 1–2. “Documents relating to Wexford friary and parish,” comp. Pádraig Ó Súilleabháin, Collectanea Hibernica (Dublin and London), 8 (1965): 126–27. Evangelical Magazine and Missionary Chronicle (London), 22 (1814): 75. George Conroy, Occasional sermons, addresses, and essays (Dublin, 1884), 315–27. M. F. Howley, Ecclesiastical history of Newfoundland (Boston, 1888; repr. Belleville, Ont., 1979). Liber Dubliniensis: chapter documents of the Irish Franciscans, 1719–1875, ed. Anselm Faulkner (Killiney, Republic of Ire., 1978). Father Paul, Wexford friary: a short account of the history and traditions of the Franciscan friary of Wexford ([Wexford, Republic of Ire. ?, 1949]). Raymond J. Lahey, “LAMBERT, PATRICK,” in Dictionary of Canadian Biography, vol. 5, University of Toronto/Université Laval, 2003–, accessed April 24, 2019, http://www.biographi.ca/en/bio/lambert_patrick_5E.html.